Annalee Doll Description: Open eyes, open mouth, tan body, blonde hair, white eyelet dress, holds Hershey Kiss, heart shaped base. Great gift for the Hershey collector. Companions are 033497, 033496, 033795 and 033895. Annalee Doll Description: Open eyes, closed mouth smile, tan body, blonde hair, white eyelet dress, holds Hershey Kiss, heart shaped base. Great gift for the Hershey collector. Companions are 033497, 033496, 033795 and 033895. Annalee Doll Description: Squinting eyes, closed mouth with tooth - as shown, tan body, blonde hair, white eyelet dress, holds Hershey Kiss, heart shaped base. Great gift for the Hershey collector. Companions are 033497, 033496, 033795 and 033895. Annalee Doll Description: Closed eyes, open mouth, tan body, blonde hair, white eyelet dress, holds Hershey Kiss, heart shaped base. Great gift for the Hershey collector. Companions are 033497, 033496, 033795 and 033895. Annalee Doll Description: Open eyes, open mouth, tan body, brown hair, black outfit, holds Hershey Kiss, heart shaped base. Companions are 033396, 033397, 033497, 033795 and 033895. Annalee Doll Description: Open eyes, closed mouth smile, tan body, brown hair, black outfit, holds Hershey Kiss, heart shaped base. Companions are 033396, 033397, 033497, 033795 and 033895. Annalee Doll Description: Open eyes, open mouth, tan body, brown hair, black outfit, holds Hershey Kiss, heart shaped base. Companions are 033396, 033397, 033496, 033795 and 033895. Annalee Doll Description: Last one. Open eyes, open mouth - as shown, tan body, brown hair, black outfit, holds Hershey Kiss, heart shaped base. Companions are 033396, 033397, 033496, 033795 and 033895. Red vest and heart base are faded as shown in photo. Annalee Doll Description: Last one. 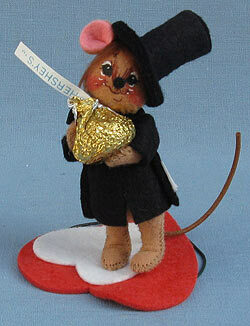 Open eyes, closed mouth smile - as shown, tan body, brown hair, black outfit, holds Hershey Kiss, heart shaped base. Companions are 033396, 033397, 033496, 033795 and 033895. Annalee Doll Description: Open eyes, open mouth, tan body, white hair with red bow, red dress with white lace, holds "Be Mine" heart. Facial expression may vary slightly from photo. Annalee Doll Description: Last one. Closed eyes, open mouth - as shown, tan body, white hair with red bow, red dress with white lace, holds "Be Mine" heart. Annalee Doll Description: Open eyes, open mouth, tan body, blonde hair, white lace dress, holds heart. Companion is 033895. Can also be used as an ornament or a package topper. Annalee Doll Description: Last one. Open eyes, closed mouth - as shown, tan body, blonde hair, white lace dress, holds heart. Companion is 033895. Can also be used as an ornament or a package topper. Annalee Doll Description: Open eyes, open mouth, tan body, black outfit, holds heart. Companion is 033795. Can also be used as an ornament or package topper. Annalee Doll Description: Closed eyes, open mouth, tan body, black outfit, holds heart. Companion is 033795. Can also be used as an ornament or package topper. Annalee Doll Description: White bodies, boy and girl mice in heart box of chocolate candies. Facial expressions may vary.